Today's devotional is by Nichole Howson. She is a Business student who grew up in a town outside of Windsor, Ontario, on a dairy and cash crop farm where she learned what it means to work hard, and what is involved to be successful. You can read more about her on her blog, Defying Shadows, or catch up with her on Facebook and twitter. Have you ever been so far under that you feel like there is no way out? So stressed that you do not think you can get through one more day? So sick that you are sure this is the end? I remember being in so much physical pain every day and night, for so long, that I lost count of how many days I laid in bed. I remember feeling so empty inside; so discouraged from the illness that followed me, no matter how good of a day I may have been having. Depression can do that to people. No matter how bad my day may have been there was a truth that helped me face another day. I have to give this emotional pain to God. I have to let go and trust him, and in return, He will sustain me. He will help me through another day. I love the wording of this verse. It doesn’t say, hand God your cares. No. 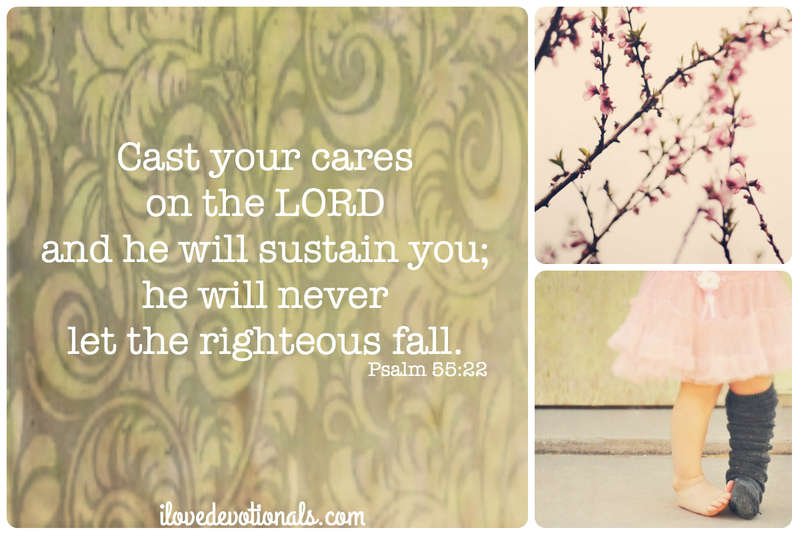 It says cast your cares on the Lord. Have you ever seen someone cast a fishing line? Their whole body goes into it! The same thing should happen to our spiritual body! We shouldn’t just let half of it go to God. We need to put our whole spiritual body into it and cast our cares to the Lord. How the weight is lifted immediately off your shoulders. Those whom trust God, and cast all your cares onto him, will be sustained. God will never let the righteous fall. If you trust in Him, He will guide you. He will help you. He will heal you. Let God sustain you. He won’t let you fall. Ponder: What do you need to cast onto God today?